Cooking with your kids is a picture-perfect moment that new parents dream of one day sharing with their children. If you have a child with disabilities, you may wonder if whipping up a batch of cookies together is a possibility for you and your child. 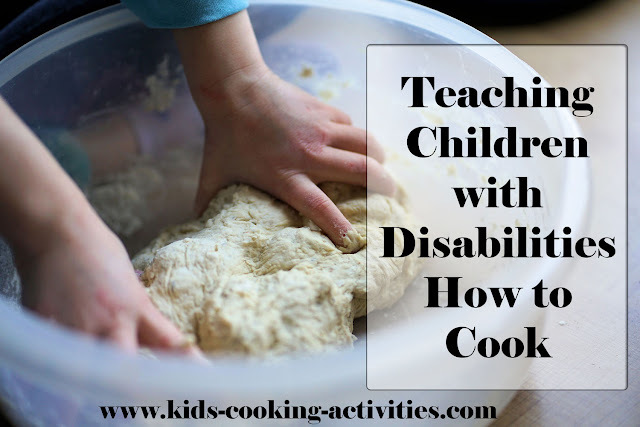 Teaching kids with disabilities how to cook isn’t only possible; it’s also an important life skill to promote independence in kids with special needs. However, it does require some special considerations. For children with physical disabilities, home modifications may be necessary to create an adaptive kitchen. You don’t have to complete a full kitchen remodel if it’s not in your budget. Rather, find adaptive solutions for the areas your child will need most. Installing an open space under the sink makes it accessible to wheelchair users, while a side-by-side refrigerator improves accessibility over top-freezer models. You can use the kitchen table as a seated workspace or follow ND Assistive’s recommendation and install pull-out lower counter space. Kitchen utensils designed for kids give your child the freedom to experiment in the kitchen while relieving parental anxieties about handing your budding cook a sharp knife. And because many kid-friendly kitchen tools are designed with ergonomics in mind, they’re easier for children with fine motor impairment to maneuver. However, if your child proves herself able, don’t be nervous to advance to the adult versions. As long as knives are kept sharp and children are instructed on proper handling, cutting and slicing is perfectly safe. Nervous parents can turn to A Healthy Slice of Life for step-by-step instructions on teaching kids how to use knives. Once your kitchen is set up, it’s time to introduce cooking concepts. Wait for a day you have plenty of time for hands-on teaching, not an evening you’re rushed to get dinner on the table. Cutting and peeling vegetables, mixing ingredients, and shaping cookies are good places to start. First, gather ingredients and equipment and explain each item to your child so he understands its name and use. Describe what you plan to do, then teach by slowly modeling the process, repeating as necessary. Repetition and consistency are key. Once your child understands a concept, allow him to try with you hand over hand before graduating to independent practice. Always supervise your child while cooking until he’s experienced and able enough to do it alone. However, realize that you only have two eyes, and you can’t monitor everything at once. It’s important to have safety measures in place to prevent fires and kitchen accidents. Keep flammable items away from the stove, point pot and pan handles toward the wall, keep hair pulled back, and don’t wear loose clothing while cooking. Make sure the smoke detector and fire extinguisher work and that everyone knows what to do in the event of an emergency. Cooking with your child should be an experience that promotes self-confidence. To that end, it’s important to keep the environment relaxed, fun, and positive. Start with simple tasks that are within your child’s established ability level to build confidence and do your best not to react with frustration when your child struggles with a task or fails to follow instructions. Instead, use mistakes as a signal that you need to slow down and reinforce rules and lessons. When your child shows interest in an ingredient, recipe, or technique, seek out safe ways to explore that interest instead of writing things off as too difficult. Teaching your child to cook is special for parents. But when your child has disabilities, making your cooking lessons safe and effective requires a little extra planning. However, that doesn’t mean it’s not possible—far from it! When you follow this advice, you can ensure your child’s first cooking experience is a positive one.